This is a joint giveaway with Parenting God’s Children and Natural Parents Network. You may enter at one site only. Please find the section marked “Win it!” for the mandatory entry and optional bonus entries. Ah!Natural Baby is offering our readers a giveaway of 10 Color Blocks and a Waddles the Duck Teether, a value of $35! The Color Blocks are absolutely beautiful and vibrant with no sharp corners for little ones to hurt themselves on. They’re a great size for stacking and sorting. Waddles the Duck is just outrageously cute, and perfect for little hands – and mouths! Based in Portland, Oregon, Ah!Natural Baby was created by two brothers who watched their sister struggle to find safe toys for her sweet babe. They figured if she was having issues, there were other mothers out there having the same issues. They were right! The toys are made of Pacific Northwest Wood. They are dyed with natural, plant based dyes made from berries, spices and vegetables. The toys are then sealed with a finish of beeswax and grape seed oil. All of which are safe for your babe! The blocks come in sweet little handmade bags to keep them together. And I absolutely love their tagline: “Your baby never worries about goes in their mouth, so neither should you!” SO TRUE! Andrew at Ah!Natural Baby was very generous in sending my family a wonderful array of products to play with. We received a Number Block set, a Color Block set, a DuoCube Rattle and Teether, a Diamond Teether and both of my girls received a Custom Name Block set! I was literally in shock, and quite frankly, so were the girls! Each item was so unique and beautiful – some look more streaky, some look more knotty, some are spotted (I know, these are all very technical terms.). 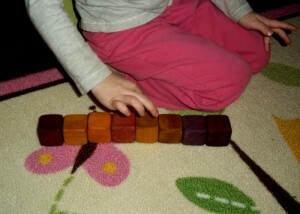 When we first received the blocks, we all sat for a long time, looking at and examining each block. The numbers and letters are branded into the block. The Color Block set is seriously amazing – the colors are so beautiful, vibrant and unique. The Diamond Teether is very cute and perfect for gnawing on (Abigail, not me!). The DuoCubeis probably my favorite because it boggles my mind. There is a cube inside a larger cube with circles in it (not doing it justice). The thing that gets me is that the smaller cube cannot be removed, it was all carved as one piece! I have very busy hands, so if I’m sitting, listening or playing with the girls or whatever, I’m playing with the DuoCube…so maybe that one’s my toy! Maybe more fun to knock down! 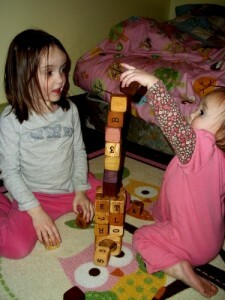 The girls absolutely LOVE these blocks and toys! They are a little larger than I expected (Though the website clearly states they are 1 5/8 inch square), so they stack VERY well and VERY tall! 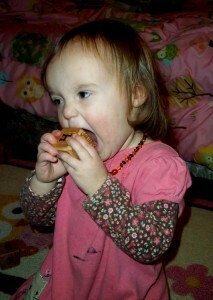 We’ve gotten a stack to go just over Esther’s (4 years) head! Of course Abigail dives at the tower to make sure it doesn’t go taller! It’s also super fun for Esther to use her Name Blocks to practice spelling her name and the Number Blocks to practice her numbers. Abigail likes practicing the colors with the Color Blocks, although her first guess is almost always ‘purple!’ Abigail also really loves the Diamond Teether and DuoCube, both of which have made a home in our diaper bag. They are wonderful for distracting from a stressful situation, or playing with while struggling through diaper changes. A dream for mamas, for sure! Another thing the girls LOVE to do with the blocks is bag them up and take them on ‘trips’ around the house. I’m not sure as to the draw of this, but whatever makes them happy! Unfortunately, our over curious and crazy dog, Rowdy, found some interest in the blocks, too. Namely, the Color Blockset – I’m guessing because of the natural foods used to dye them. We resolved the issue by purchasing a plastic bin with handle locks to keep them in. We generally play with them during our school time, so they can stay upstairs, safe from our Ridiculous Rowdy! You can purchase your own Color Block Set and Waddles the Duck at Ah!Natural Baby. The Color Block set is $25 and Waddles the Duck is $10, there are a variety of other fun toys and teethers available as well! Shipping is dependent upon your location and the size of your cart, but if you were to go and get these great items, it would be approximately $7.00. And just for Natural Parents Network and Parenting God’s Children readers, Ah!Natural Baby is giving a 15% discount on all orders from now through 4.10.12. Enter coupon code Parenting during the ordering process. For your own chance to win a 10 Color Block Set and Waddles the Duck Teether from Ah!Natural Baby, enter by leaving a comment and using our Rafflecopter system below. The winner will receive a set of 10 Color Blocks and a Waddles the Duck Teether. Contest is open to US and CANADA. MANDATORY ENTRY: Visit Ah!Natural Baby and tell us one thing you have learned about the company! You must enter your name and email address in the Rafflecopter entry system for your entry to count, after leaving a comment on this blog post. This is a joint giveaway with Parenting God’s Children and Natural Parents Network. You may enter at one site only, and we’ll be recording IP addresses to ensure that there are no duplicate entries. That said, please do visit and enjoy both sites! Contest closes 4.10.12 at 11:59 p.m. Eastern Time. 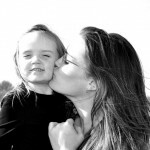 Sarah is a God-loving stay at home mom to two beautiful little girls, Esther and Abigail and a birth doula. She’s passionate about other mothers, natural family planning, natural birth, breastfeeding, cloth diapering, babywearing, buying local, making baby food and homemade products for around the house, gardening, composting, recycling, and her backyard chickens. Sarah writes at Parenting God’s Children. I learned that their products are safe! My daughter will enjoy the blocks! Beautiful, natural toys – love them! These would be for my daughter (6 months), tho I’m sure the 3 year old would get equal pleasure from them! I visited the website and learned that company was started by two brothers whose sister’s son, their nephew, had nothing safe to play with. Woila! A company was born! I love the custom name blocks and that they use natural dyes to color the blocks. My almost six-month son will enjoy the blocks and teethers. 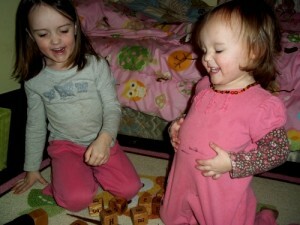 Though I could see my older girls of ages 4 and 6 playing with the blocks too. I learned that they use plant based dyes… awesome! Such a great site. Thanks for the great giveaway! One of my dear friends had a beautiful baby boy just yesterday! These will make a lovely gift for the new little one. I learned that Ah Natural baby was started by two brothers after their sister was extremely frustrated trying to find safe toys for her baby 🙂 Thanks for the great giveaway! Teether: My girlfriends new baby. I learned that they only have stores in the USA. I entered your Go Green diapers giveaway. fruit & veggie dyes for the colors! I’d like to get custom name blocks. My daughter when shes old enough to need them. She was born March 7th,2012. I love that they use non-toxic glues and all natural materials. I’d love to win!